This, in my opinion, is the absolute best time of year. Football season is in full swing and the weather is cooling down. We have apples, leaves changing and the colors of autumn emerging, mulled cider, pumpkins, and the best holiday of the entire year, Halloween. That sinister time of year based on All Hallows’ Eve, when the souls of the departed were remembered, has become an occasion to celebrate fantasy and fright. Our frightful forms of entertainment come from the likes of Freddy Krueger, Leatherface, Jason, and Michael Myers. In centuries past, frightful entertainments were painted in oil on canvases and panels. The history of art is abundant in images of horror, so what better time than October to examine them? 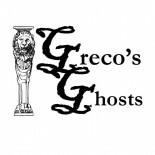 This month, Greco’s Ghosts will celebrate spooktacular October with themes of terror. Sinister indeed. Ever met the rebel angels? They are a popular subject in religious, literary and cultural history. Spiritual denominations, theologians, and academic groups interpret the story of the rebel angels in different ways. In this case, the history of art, post seventeenth century, has followed much of the influence of a certain epic poem by John Milton. Click image to enlarge. 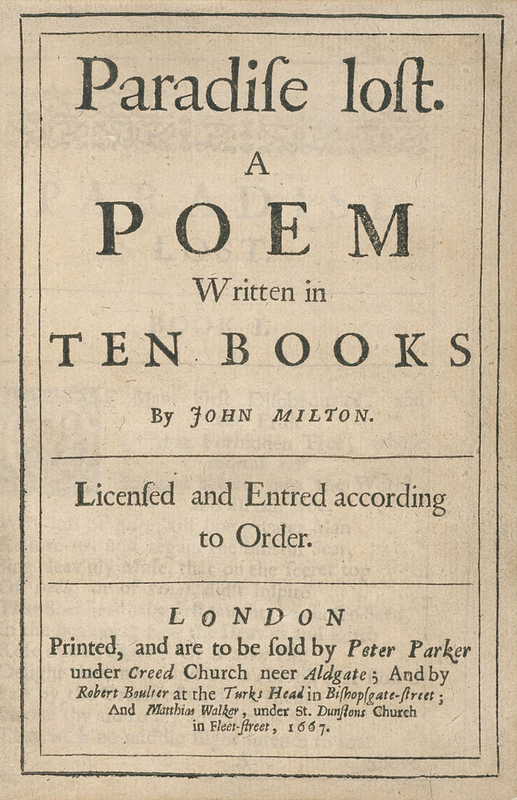 Title page of Paradise Lost, first version, by John Milton, 1667. We’ve talked about Paradise Lost before, but this article concerns one of its chief characters. According to a common interpretation, Satan, once called Lucifer, was a beautiful angel in Heaven. He denied God’s creation of angels, calling his race self-begot, and convinced many of his fellow angels to rebel against God and claim His authority over Heaven. The War in Heaven was thus begun, and ended with defeat of the rebel angels because, well, you can’t beat God. Archangel Michael lead God’s armies against the rebel angels and cast them out. The vengeful Satan then plotted to corrupt God’s most prized creation, Earth, with sin. His revenge against God was to commence the Fall of Man, which he did by his temptation of Adam and Eve in the garden. Satan, the Great Deceiver, became the ruler of Hell, with the continued hope that his temptation of man’s free will would damn souls to his underworld and prevent them from entering God’s kingdom. Milton’s epic poem was well loved by artists, who used it as new inspiration to work with religious themes. Also dealing with themes of terror with Satan and other evil figures, Paradise Lost provided new blueprints for artistic creation, just as Dante’s Divine Comedy had three centuries before. Of particular interest to artists was the imagination of a war in Heaven as well as the later ill-attempted plots to take revenge. Many of the artistic interpretations of this story are laden with images of evil, making them quite scary. Some, if convincing enough, can even bring us to think about what could have happened if this rebellion were successful. The thought is pretty damn frightening. Artists have often depicted the story of the War in Heaven in its climactic moment with Michael and his army casting the rebel angels out. This may have been the most important way to deliver the message of God’s infinite power against evil. But although this evil was defeated, artists were unable to resist the potential for invention in creating the various faces of evil. The rebel angels are often depicted with monstrous features, as if they immediately gained these horns, tails or other grotesque parts while physically falling from Heaven. Giving them grotesque features was also an easy visual indicator for distinguishing the bad guys from the good guys. A painting by Charles Le Brun shows the preferred transportation-by-cloud method of travel by angels. Atop a cloud funnel of twisting bodies hovers Michael the Archangel. Shadows and light are highly contrasted, with a particular spot of light focused on a gnarled group of bodies at the bottom foreground, entangled with various demons and composite creatures. Many of the monsters are hidden in the shadows with only parts of them clearly visible. We can see various patterns of wings, scaly hands with claws, open jaws, serpentine tails, and even a random lion’s head. By revealing only parts of the figures Le Brun adds to the suspense. In a composition of undulating motion and intense light, this painting employs the theatrical Baroque but also includes the softness of a Rococo atmosphere in the background. Click image to enlarge. Charles Le Brun (French), The Fall of the Rebel Angels, c. 1685, oil on canvas, 162 x 129 cm, Musée des Beaux-Arts de Dijon. Despite the controversial use of ivory in art objects throughout history, there’s no denying that some very fascinating things have been sculpted from it. 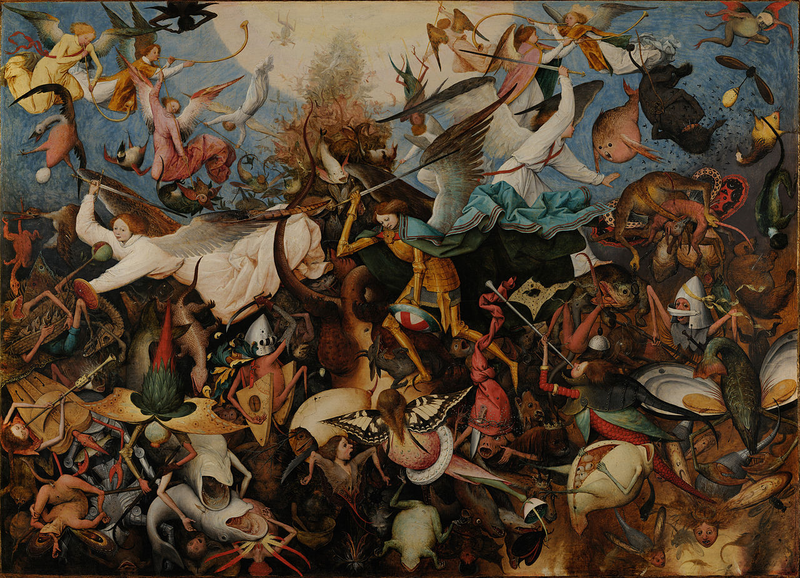 Take, for instance, this incredible version of the Fall of the Rebel Angels. This spectacular piece by an unknown artist was completely carved from one piece of ivory. Click image to enlarge. 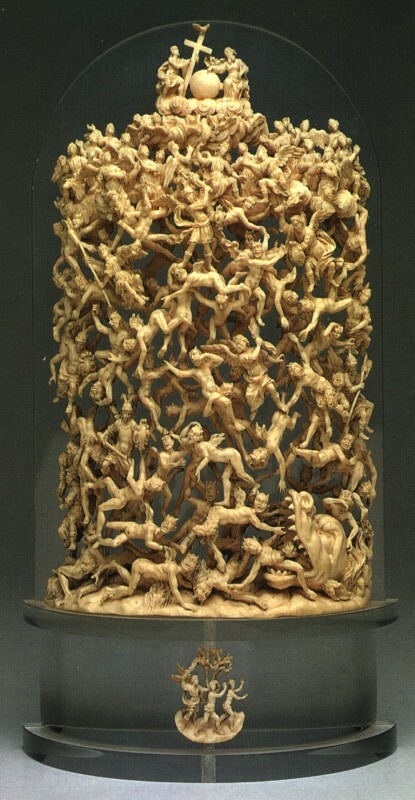 Unknown artist (formerly attributed to Jakob Auer, Austrian), The Fall of the Rebel Angels, early 18th century, ivory, 27.31 x 15.24 cm, The Nelson-Atkins Museum of Art, Kansas City. Showing an array of figures all connected or touching at some small area, this sculpture is small and fragile, but no less impactful. Some figures display small horns and grotesque, demonic features. Michael the Archangel can be seen at the top center of the group, standing over a devil and swinging his weapon upward, about to strike. At the bottom a monster opens its jaws wide and eagerly takes in the falling angels, ready to swallow them into Hell. Going backward to the sixteenth century, there is a deliciously frightening depiction if this subject, created before the time of Paradise Lost, by Pieter Bruegel the Elder. Part of the Flemish Renaissance, Bruegel was obviously heavily influenced by Hieronymous Bosch. But differences lie in their compositions. In this instance, Bruegel gives no regard for negative space or compositional elements that ease the eye, instead he does the exact opposite and paints an eyeful. Click image to enlarge. Pieter Bruegel the Elder (Flemish), The Fall of the Rebel Angels, 1562, oil on oak, 46 x 63.8 in, Royal Museums of Fine Arts of Belgium, Brussels. This composition is a swarm of bodies and monsters of every invention. Bruegel has not allowed the corrupt angels to look back from their deeds. They have already transformed into a menagerie of composite creatures of every grotesque form. It’s impossible to tell where one figure begins and where the other one ends. You cannot determine which limb belongs to which creature. Some of them are quite funny looking, but most are monstrous. It is a pile of chaos. Yet the true angelic figures are discernable atop the mess, noticeably calm and businesslike in their defeat of the rebels, as if they knew this was coming all along and never for a second believed it could have gone the other way. A closer look at the top of the composition brings into focus the familiar shape of a funnel of winding and twisting bodies, struggling with each other as they plummet from Heaven, framed by a large sun. My new favorite work related to this subject is a painting that hangs right in my backyard. The Joslyn Art Museum houses this work by François Cibot with a somewhat unique perspective on the theme of rebel angels. A duo of fallen angels is pictured in a fiery wasteland, presumably in Hell immediately after their defeat, as indicated by the bloodstains on their wings. In the essence of French Romanticism, this painting is highly emotional and although there is no intense action or gesture, there is a heightened drama that is accentuated by contrasting light. The lightness comes from the figures’ skin and tattered wings and is then starkly contrasted by burning colors of red of the garments and flames in the distant background. Everywhere else is darkness. Click image to enlarge. 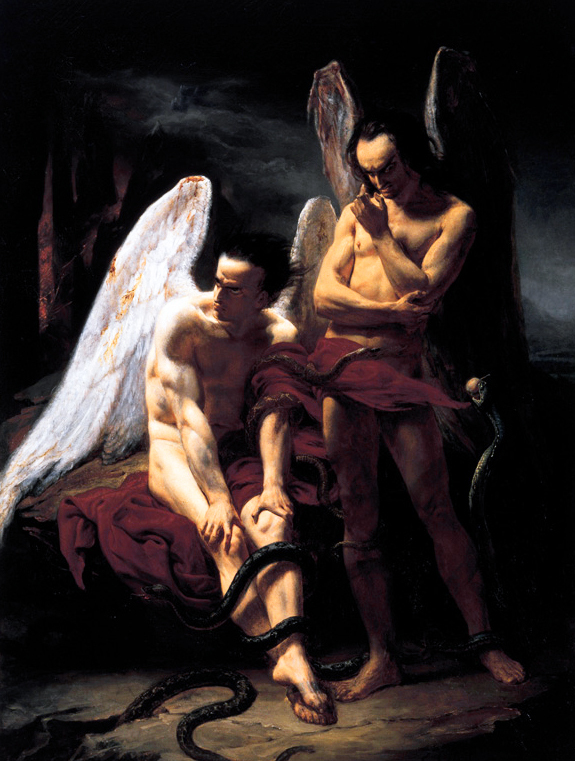 François B.-M.-E. Cibot (French), Fallen Angels, 1833, oil on canvas, 124.46 x 95.25 cm, Joslyn Art Museum, Omaha. On the surface it seems that these two figures are in a state of dejection given their surroundings, their oblivious gazes, and having just lost a war. After all, they still have their immense albeit, damaged wings. Nor is there anything demonic about their appearance. On the contrary, if you ignore their wings, they seem very realistically human; they have familiar looking bodies, natural limbs with normal hands and feet, and palpable muscles. What is more, this is a fairly large painting, almost making it similar to the composition of a portrait. Is this a regretful look at the consequences of Satan’s temptations? Having just stood in front of this painting before writing this article today, I would argue that it is not. Looking closely at the rebel angels’ faces, one sees intensely furrowed brows, outlined in black. The standing figure’s upper lip is raised in a slight sneer. He lifts his left hand up as if about to proclaim something, or else touch his chin or forehead with it in deep thought. The seated figure’s chin and lower lip protrude in anger. If ever there were an actor looking for tips on how to convincingly brood, I would suggest they study this painting. This work, to me, shows the very definition of brooding. The whites of the bottoms of their eyes suggest an upward gaze of intense plotting. They aren’t dejected, they’re pissed. So pissed that they want revenge, which is the very subject of their brooding thoughts. Though unsuccessful in their previous attempt to thwart Heaven’s authority, they can no longer turn back or feel remorse. They have already turned. Their plot of revenge is told by the snake to the right of the standing angel, slithering up his leg and holding an apple in its mouth, signifying the Fall of Man. Other snakes slither around the two figures, entwining themselves and wrapping themselves around the angels’ limbs. 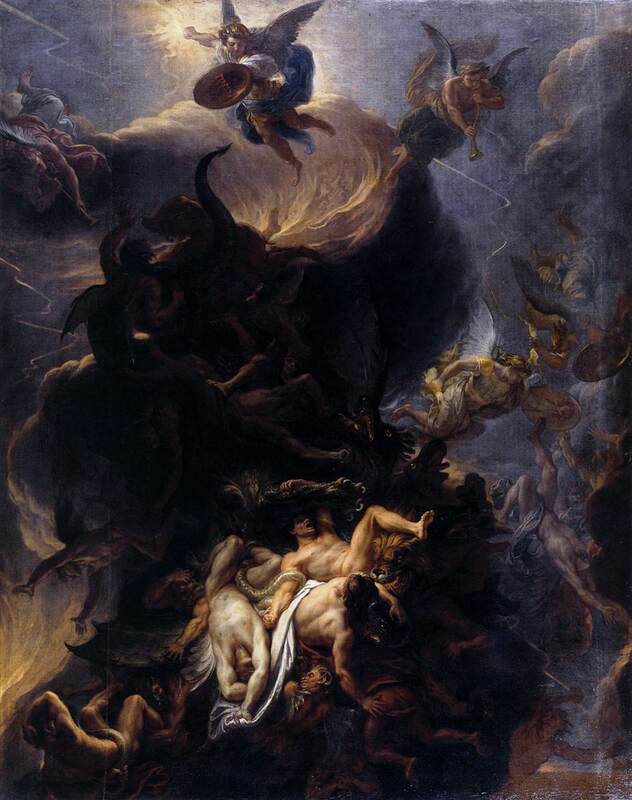 With this the rebel angels are both literally and symbolically being consumed by evil. This entry was posted on October 3, 2014 by KristyDurk in Baroque, British, Eighteenth Century, European, Flemish, French, German, Literature & Mythology, Neoclassicism, Nineteenth Century, Renaissance, Romanticism, Seventeenth Century, Sixteenth Century and tagged Archangel, Baroque, Book of Revelation, Bosch, Bruegel, Cibot, Dante, epic poem, fallen angels, Flemish, grotesque, Halloween, Heaven, Hell, horror, John Milton, Le Brun, literature, Low Countries, Lucifer, Michael, neoclassicism, October, Paradise Lost, Rebel Angels, Renaissance, Rococo, Romanticism, Satan, War in Heaven.